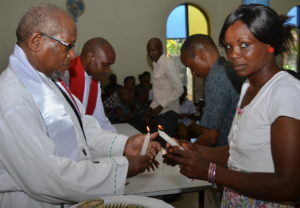 The Kenya Partnership was founded as a Twinning Project with Kongowea and Wesley Churches, Mombasa approximately 25 years ago by the late Elizabeth and Adrian Shafford. They were touched by the plight of young people in Kenya who were denied anything but extremely basic education.Through them, a number of young people were able to achieve their ambitions of going on to senior school and further education, one becoming a doctor, another a pharmacist.The Twinning Project expanded rapidly to include church building programmes, Nursery Feeding Programmes, Catering and Woodworking Projects and helping to establish a Local Hospice. A fresh-water well was dug and a water storage facility was established in memory of Adrian. The work has now developed into two distinct areas and become known as The Kenya Partnership. 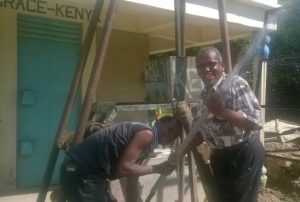 It is accountable to Billericay Methodist Church Council and is co-ordinated by a team of church members.A major area of support is the sponsorship of orphaned or single parent children in Mombasa. At present there are 8 young people in schooling and 2 in college/university (July 2016). The youngsters are referred by Ministers or senior Lay Members at the Mombasa churches.The second area supported is the GRACE (Good-Hope Resource And Community Empowerment) Centre, which is a community project in an impoverished area of the city, run by Rev Dr Pius Kagwi. This man of God is an inspiration and is such a blessing to the people of Mombasa. It has been a real privilege to work with him over the past 2 years. Pius’ vision is to allow people to be independent and self-supporting. 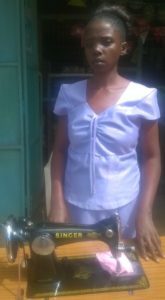 To this end, our donations have established a Sewing School for young women, and a Motor Bike Taxi service keeping young men away from Street gang culture and drugs.The community had no fresh water, and the village women had to walk several kilometres to carry it back. 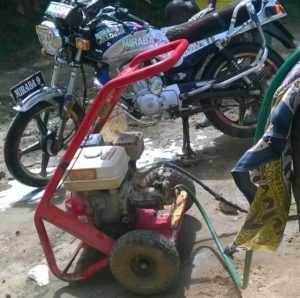 A special gift made in memory of the late Martyn Hanton, a member of the team, made possible the drilling of a bore hole to provide running water next to the Grace Centre, making a huge difference to the whole community and allowing Pius to offer young men jobs to start a Bike Washing Service. A large number of people live in the most appalling conditions at the edge of Mombasa on the Mwakirunge dump site. At Christmas and Easter, Billericay Methodist Church raises money for basic food parcels, which Pius distributes to as many families as possible, using a van which the Partnership were able to provide when his old one could no longer be repaired. This van is also used as an ambulance when needed! A very important link in the Partnership is the Rev Eunice Indangesi, a past minister at Kongowea Church. Eunice studied at Queen’s College Birmingham UK for a year and we were delighted when she was able to visit us and bring first hand news.Members of the Church family were able to see all that is happening in Kongowea and Wesley churches and visit the Hospice during visits on two occasions. At present Rev Pius feels visits from the UK would be unsafe. Our income comes in two ways, which fits the two types of work. For the children’s education, regular committed giving is faithfully received from a number in the church family in Billericay. The Grace Centre support is largely from donations and fund raising in response to specific appeals. The Kenya Partnership will continue for as long as the Church family and wider community continue to support it. 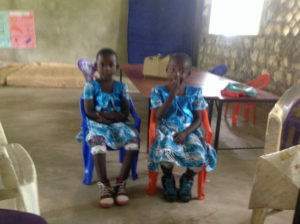 As the young people complete their education programme there are always new requests for sponsorship and Rev Pius continues to have new vision to help the lives of his people. We are the only people they can ask for financial help….how can we say ‘No’!If you would like more information, please use the contact form below.